As expected, Nintendo has confirmed that the Wii console will drop in price to $199.99 in the US. Nintendo has also reduced the trade price of the Wii in the UK and introduced a new £179.99 bundle which includes the ultra-sensitive Wii MotionPlus dongle and a bundled copy of Wii Sports Resort. Nintendo's price cut, announced at the Tokyo Game Show, is hardly a surprise, with the only real shock just how long the Japanese gaming giant has gone without dropping the cost of its innovative console. "We will be reducing the trade price of Wii to retailers from 2nd October 2009. 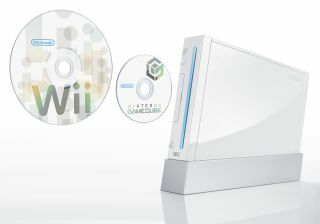 In the UK and Republic of Ireland we are also introducing a new configuration of Wii hardware from 2nd October 2009 which will replace the current offering and will include the Wii console and Wii Sports with the new Wii Sports Resort game and Wii MotionPlus accessory," reads a Nintendo UK statement just in. "This will be available to retailers at the newly reduced trade price. The ultimate price to consumers is, of course, determined by the retailers. Our aim has always been to expand the gaming population and there are still many more people out there who have not yet experienced the fun of video games. This compelling offer will hopefully make Wii more accessible to everyone." In fact, the Wii's steady pricing from launch actually makes it the record holder for the longest amount of time that a console has been at market without being reduced in cost. This is despite competition from the likes of Microsoft's Xbox, which was given a big boost in sales following a significant price drop 12 months ago. Likewise, Sony's decision to drop the cost of the PlayStation 3 – along with the introduction of the PS3 Slim – also handed the platform a major boost. "Wii has reached more video game players than any game system before because it attracts everyone - both men and women, and people of all ages," said Cammie Dunaway, Nintendo of America's Sales and Marketing chief, in a statement. "Our research shows there are 50m Americans thinking about becoming gamers, and this more affordable price point and our vast array of new software mean many of them can now make the leap and find experiences that appeal to them, whatever their tastes or level of gaming experience." It is a key time for the Wii, with the arrival of Wii Fit Plus in October hoping to take advantage of the staggering number of people who splashed out for the Wii Balance Board. And for more traditional gamers, the latest Mario games are also on the horizon, which includes New Super Mario Bros – a side scrolling collaborative platformer that is guaranteed to tickle your retro pleasure zone.